Alongside our post ‘2018 – a year of non-stop campaigning’ here is a month-by-month review of our campaigning efforts and the many positives we achieved. The year started with one of the worst NHS ‘winter crises’ and the government cancelling the entire NHS elective programme in England for January. In the end 50,000 surgical and other procedures were cancelled with huge impact on trust finances and waiting lists a year later. 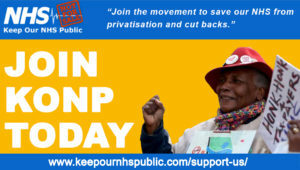 Immediately People’s Assembly, Health Campaigns Together and Keep Our NHS Public called a national day of action for Saturday 3 February. There was more drama in January which saw the collapse of Carillion, the British multinational facilities management and construction services company with tentacles wrapped round some huge PFI contracts. Though this review is concentrating on campaigning successes, these events were a huge ‘I told you so’ moment for campaigners against privatisation in general and PFI in particular. Our second great national joint action in two years with People’s Assembly was preceded by street theatre at Westminster Bridge and Parliament. 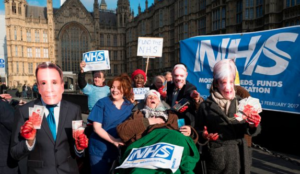 The national #ourNHS Day of Protest on 3 February highlighted the pain, death and misery of the government’s ‘winter crisis’. There were 55 events predominantly in England but also in Scotland and Wales – a powerful statement across the land including the London demonstration of 60,000. US President Trump ridiculously claimed the march was protesting against the NHS and ended up giving our message even greater reach including in the USA. 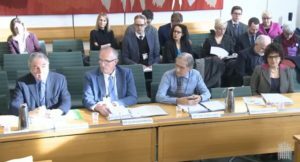 Also in February, three KONP members gave evidence on ACOs at the Commons Heath & Social Care Select Committee. 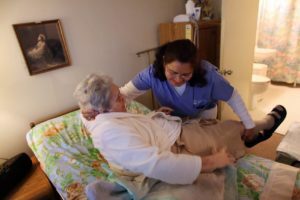 In addition to the national ACO contract JR, at least three other KONP groups were taking the challenge to their local STP closures and mergers to the courts. Save South Tyneside Hospital, South Yorkshire (Barnsley Save Our NHS) and Dorset KONP – as well as the Huddersfield Royal campaign (Hands Off HRI). 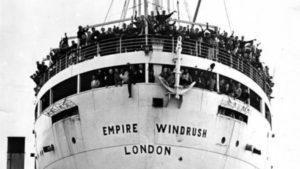 The Windrush scandal blew up and Home Secretary Amber Rudd had to resign with the exposure of the hostile environment inherited from Theresa May’s time at the Home Office. In April, KONP promoted the Visual displays by Marion Macalpine and team, ‘How come we didn’t know?’ and ‘The PFI Initiative: how come we’re still paying for this?’ – with an accompanying booklet by Helen Mercer on PFI policy across the public sector and government departments. Back in the summer of 2017, KONP members made official complaints to the Advertising Standards Authority about the brazen claims of the private doctor company, Push Doctor, that they offered patients NHS doctors in consultation. We listed several grounds. In April we heard that the majority of the complaints submitted by us and others were upheld. 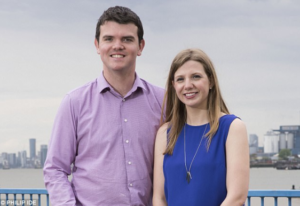 Push Doctor were found guilty of breach of guidelines and had been instructed to alter their advertising and website to accord with the truth. 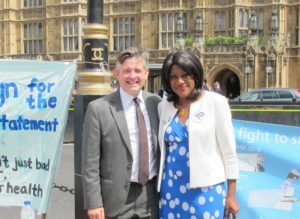 A very busy year of legal battles for campaigners and individuals saw another very important victory in May when Dr Chris Day finally forced Health Education England to concede the obvious: that they had employer’s responsibilities to protect the junior doctors in their employ as trainees against victimisation on whistleblowing. Dr Day went on to face very difficult employment tribunal hearings where the potentially life- and family-crippling costs forced a premature end to the hearing aimed at his winning a case against his loss of employment. Good news also in May: Wendy Savage, Life President of KONP, was given an award for her outstanding contribution to UK health at a BMJ award ceremony. Our Essex campaigners in Southend KONP and Save Southend NHS won an important victory when the five CCGs voted to keep blue light A&E services (HCT July 2018 p8) at all three existing hospitals – Basildon, Chelmsford and Southend. Definitely not something to celebrate was Jeremy Hunt’s departure from his role as Secretary of State for Health after six years. The damage he has done is incalculable but we did not share some people’s joy given that his replacement was Matt Hancock, obsessed with IT gimmicks, and prepared to live with conflicts of interest as he backed Babylon and GP at hand subsequently clearly breaching ministerial code but getting away with it. 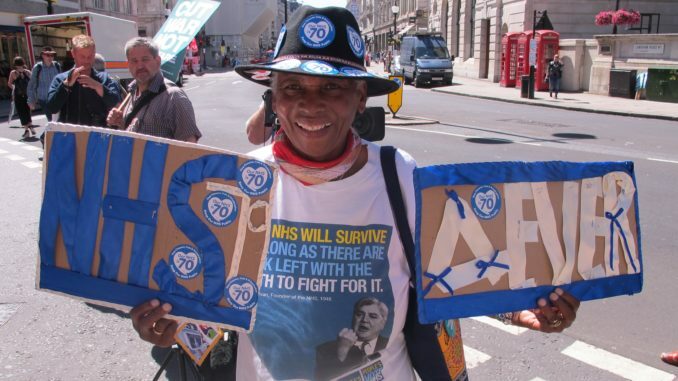 The NHS at 70 is clearly something to celebrate as well as something to defend against this government’s constant neglect and undermining. 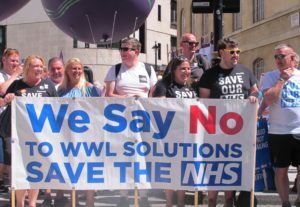 The #NHS70 demonstration organised by HCT and KONP, the TUC and People’s Assembly was a great combination of the two – great pride and joy combined with great anger and determination to oppose plans to underfund and privatise. Victories and delays were won in Bristol and in East Kent and Warrington, Wigan and Leigh NHS Trust (see HCT July 2018 pp2-3) and a pause was announced by NHS Improvement, stung into action (HCT October 2018 p5). KONP groups in North West London were quick to picket the GP at hand base in Fulham protesting the privatisation link of this NHSE-endorsed app-based practice funded and organisationally linked to Babylon whose app is the heart of this disruptor. GP at hand threatens to undermine London’s NHS GPs by taking selective low-risk sections of the population and diverting funding from GPs caring for the vulnerable and the chronically ill or disabled. 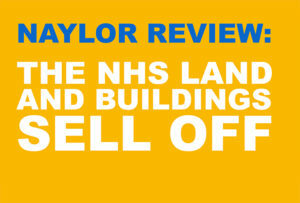 KONP’s first in a series of short videos for social media was released in August to highlight the dangers of the Naylor Review and the recommendations quietly being enacted to sell off vast amounts of the NHS estate. We launched the second in our series of ‘What you need to know’ short videos for social media – ‘What is an Integrated Care Provider?’ – as part of our joint campaign against the Integrated Care Provider (aka ‘ACO’) contract. This explained the complexity and dangers of the proposals for ‘integrated care’ and helped build our campaign with We Own It (see ‘October’). A string of outright victories and ‘cautious positives’ came together in September. 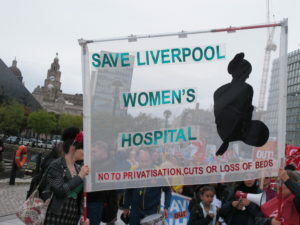 The Save Save Liverpool Women’s Hospital campaign had an impressive demonstration on the eve of Labour’s annual conference, boosted by public support from Beatle, Sir Paul McCartney. Jon Ashworth spoke at the rally and supported the ending of PFI involvement for the Royal Liverpool (post-Carillion). Earlier in the summer the government agreed to a publicly funded arrangement with the local trust for the Midland Metropolitan new hospital build (HCT October 2018 p8) after the collapse of Carillion in January and the PFI contract – and a successful campaign by Birmingham KONP. 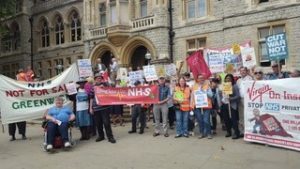 Ealing Save Our NHS claimed an important victory (HCT October 2018 p9) after uniting local opposition to Virgin Health’s involvement in tendering for a large locally divisive community health services 10-year contract. In the end Virgin backed out and did not tender. In Sheffield, our KONP group also achieved a major success in halting closures of two important community walk-in centres. The future of Sheffield’s NHS walk-in centre and minor injuries unit was secured for two years after health bosses agreed to reconsider proposals to close them. September also saw 999 winning the right to appeal, as referred to above (Legal challenge to ‘accountable care’). Rally at Houses of Parliament: Scrap the ICP Contract and Support the NHS Bill. 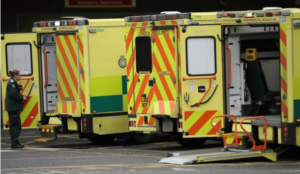 Over the summer, NHS England was consulting on a new model of health and social care provision that could see multi-billion-pound contracts handed over to the private sector. A very positive alliance of We Own It, KONP and HCT waged a campaign against this contract, with briefings to encourage people to submit their consultation responses and sign the We Own It petition of 34,000. The petition is handed in. 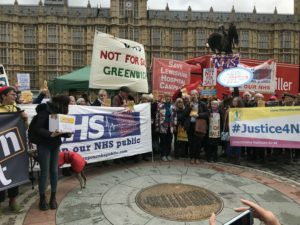 On 26 October a very successful rally at Parliament marked the end of our ICP contract campaign and we also welcomed Eleanor Smith MP who had her NHS Bill on the agenda for second reading. 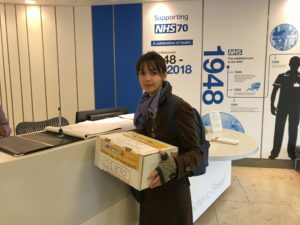 At the end we handed in the petition to NHS England. Health Campaigns Together October issue 12 was the completion of three years of quarterly publication – a success to be proud of for HCT and its editor, John Lister, who is also KONP’s co-chair. 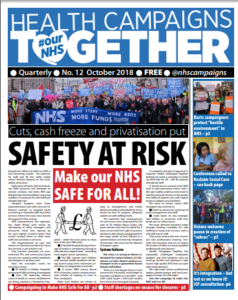 In the October issue, we launched HCT’s Make Our NHS Safe for All campaign (HCT October 2018 pp1-3). ‘Reclaim social care’ is another vital campaign launched in Birmingham at the HCT conference – following decisions at both the June KONP annual meeting and at HCT affiliates’ meetings that both organisations see the need to campaign for health and social care, as vital public services, to be publicly provided and funded. Two amazing campaigns had major news in November towards the year-end. Both are reported in HCT January 2019 (HCT issue 13 p2). 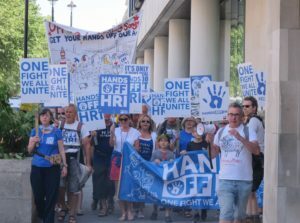 The Hands Off Huddersfield Royal Infirmary campaign (HOHRI) successfully lobbied for the council to refer CCG plans to close and demolish the HRI to the secretary of state. The Independent Review Panel that followed told the CCG to think again sending back their deficient business case. A battle won after two long years, but the final victory to keep the HRI as a full acute hospital for 250,000 people continues. Their JR is still open at present. The fight goes on. And in Shropshire, a Conservative-dominated shire, the longstanding attempt to close Telford’s A&E has taken the form of opposition to reducing it to a 12-hour A&E. 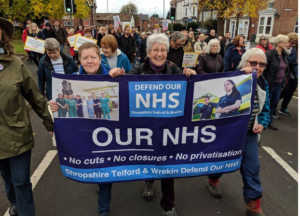 This battle was won in November with a large Telford-Council-backed march and demands to keep both hospitals (Telford and Shrewsbury) and the Defend Our NHS Shropshire campaign goes from strength to strength. 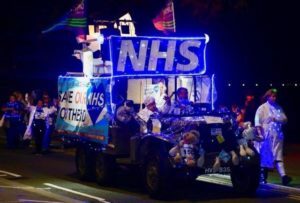 At year’s end, the grit and determination of Dorset KONP and Defend Dorset NHS campaigners have got Dorset County Council to refer plans to close Poole Maternity and A&E and lose the major trauma centre back to the Secretary of State. At year’s end the campaign has got Poole Council’s backing too. It remains to be seen how Matt Hancock will respond. We have not won every battle in 2018. But we have held the line. Save South Tyneside Hospital lost their judicial review in December and join Dorset, Huddersfield and many others in entering 2019 with unfinished business, confident that we are part of a national network of solidarity, experience and generosity of mutual support. We cannot and will not let them take the NHS away from our children. Best wishes to KONP supporters and all campaigners everywhere after a very full and successful year of campaigning in 2018. Special thanks to all NHS staff for being there through thick and thin. And sincere thanks to our KONP national team. Watch KONPNE’s 2018 video (6mins), smile and feel proud – much was achieved.